In this fast-paced world, consumers want quality and they want more options from the brands they interact with. Businesses and brands are no more stuck to display just one product. When multiple products are to be highlighted, giving each one comparable importance, long run of prints are not the way to go. Moreover, some brand products are ‘limited editions’, so, they do not require long runs. This is pushing more and more brands towards print-on-demand. They are more interested in releasing a low number of promotional material to test the market for a specific product. Larger volumes can be printed when the product is ready to go out to the market. Digital printing does not use the plate mechanism for printing. It utilizes toner or larger printers that use liquid ink. If a brand does not need runs of 500 or more, it should go for digital printing. It is the best choice when it comes to on-demand or smaller quantities of promotional materials. It is a simpler process in comparison to offset printing. Moreover one does not have to invest in plates and even the setup cost is negligible. With older methods of printing, personalization can be a tough task as one relies on the make of the printing plates. 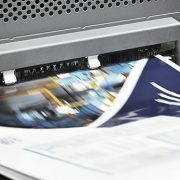 With digital printing, one can add or delete any detail by using a computer and produce prints as required. Digital printing also saves resources like water. There are lots of positive environmental factors like no pre-press stages, so no films, plates or photo chemicals which means less waste. In olden times, in order to convince the client, one press proof would be shared. One had to work on the entire set up and the plates had to be manufactured. The paper was then strung through the press, it was then printed on and cut down to size to show it to the client. The process is much easier now where you can show the client how their brand product or service will be displayed without any printing at all. Just share a digital template with the client electronically and get the design and content approved. Digital printing also prevents the use of toxic chemicals and production of hazardous physical and chemical waste. When it has so many advantages, why don’t try it by yourself? Get in touch with us for digital printing in Udaipur. Besides, find our business center in Ahmedabad for best quality digital printing. Prime Scan offers the premium quality digital printing services that appeal to your target audience. We utilize our creativity and imagination to best display your product or service. We aim at providing you prints on-demand that are excellent in design and have a perfect content layout. At Prime Scan, we use the latest print technologies to ensure the highest standard of prints to connect with both new and existing customers.